The year is 1987, and NASA launches the last of America’s deep space probes. In a freak mishap, Ranger 3 and its pilot, Captain William “Buck” Rogers, are blown out of their trajectory into an orbit which freezes his life support systems, and returns Buck Rogers to Earth, 500 years later. 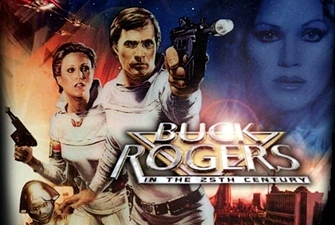 The character Buck Rogers was actually created in 1928 by Philip Francis Nowlan and was featured in the comics and a feature film. In 1979 a for TV movie was made but it was released in theaters as a test. It did remarkably well so the producers made it into a weekly series. 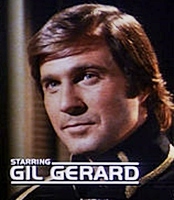 Buck Rogers (Gil Gerard) is a 1980s astronaut who is accidental frozen and returned to Earth 500 years later in the year 2491. Earth has recovered from a devastating nuclear war and Rogers unique twentieth century skills are utilized by the Earth Defense Directorate. Teamed up with Col. Wilma Deering (Erin Gray) and Twiki (Felix Silla/Mel Blanc) a 25th century mini robot they fight off attacks by the Draconian Empire. They got their orders from Dr. Elias Huer (Tim O’Connor) and were aided by Dr. Theopolis or “Theo” (voiced by Eric Server) who was a computer shaped liked a disk and carried around by Twiki. The chief antagonist was Princess Ardala (Pamela Hensley) who was the leader of the Draconians. She also had the hots for Rogers and was always trying to coerce him into marrying her. In the second season the studio scrapped the whole evil Draconians thing and sent our fearless hero and troupe out in space to explore the cosmos. The character Hawk (Thom Christopher)was added as the last survivor of a proud bird like race. 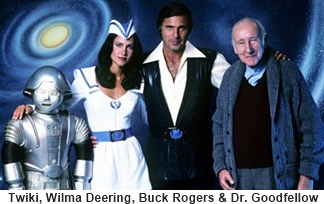 Having the same producer, Glen A Larson, wasn’t the only thing that Buck Rogers shared with Battle Star Galactica. If you were watching closely many of the sets on Buck Rogers were simply retooled Galactica sets including some of the uniforms. The Terran starfighters were originally supposed to be Colonial Vipers onGalactica and were actually used as an advanced prototype Cylon fighter in a couple of episodes. In season two Buck and the crew of the Searcher were looking for the lost “tribes” of humanity sound familiar? The remnants of humanity were searching for the lost 13th tribe of humans on Galactica.